When you think about running, you imagine a beautiful trail, comfortably paved roads, some tall trees to add some shade….sounds perfect right? So what do you do on the days that the rain storm outside looks like a monsoon? 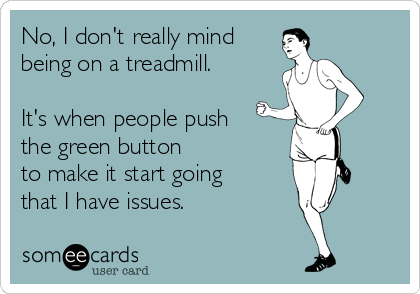 Or its so cold outside your hands freeze going to get the mail?….You hit the treadmill!!! I do love a good run in the rain…there is something relaxing about keeping a good pace, light rain keeping you cool and the roads all to yourself because you are the only crazy one running in the rain. Maybe that is why, my greatest performance ever was at the ice-cold monsoon race last year, aka, the Wine and Dine. Unfortunately, there are days where if we must run, we will need to run on the treadmill. I actually don’t mind running on it. While it is not the same as running outdoors because of climate conditions and running surfaces, it is still running! Many believe that running on the treadmill doesn’t count, but you still burn calories, sweat, and those muscles are working hard. Lets see if I can help you make those treadmill runs more interesting and fun! 2.- Run up the hills. Another plus to running on the treadmill is you can create hills! Being a Florida girl, the tallest hill we have are ant piles so treadmills come in handy. AND you don’t have to worry about torturing your quads on the way back down. For example: You can try to do 1 minute runs with a 4% incline with 2 minutes of slow, no incline in between. Keep doing it until you get to 10 repeats at a 6% incline. 3.- TV Show Tempo. I sometimes use the TV to keep me distracted and also to help me do speed work. Find your favorite TV show, (I like to watch Big Bang Theory) and once you are all warmed up, get ready to sweat! Start off at your target pace, once the commercial breaks roll in, pick it up! Speed it up a few mph faster than your target pace. Once the show comes back on, dial down the speed. When the commercials continue, hit that speed button! Make sure you do at least 5 minutes of cool down when you are done. 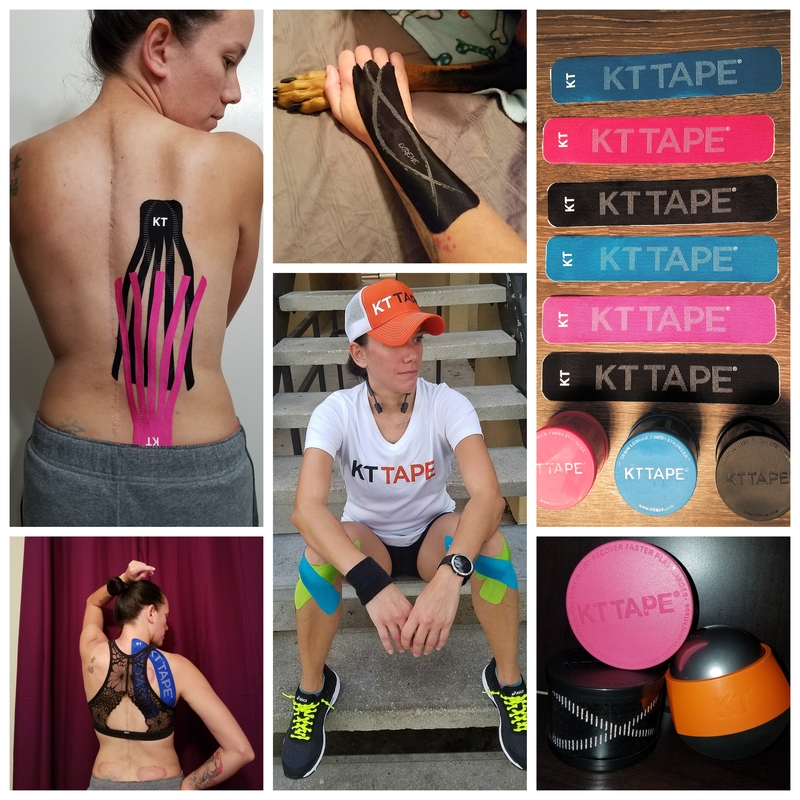 For you runners that can handle it better than me, you can do the opposite. By that I mean run your faster miles while the show is on, and slow it down for the commercials. 4.- Focus on breathing. Breathing is an essential part to running…living actually..duh! But check this out, while you are focused on your breathing and strides, you forget about running. 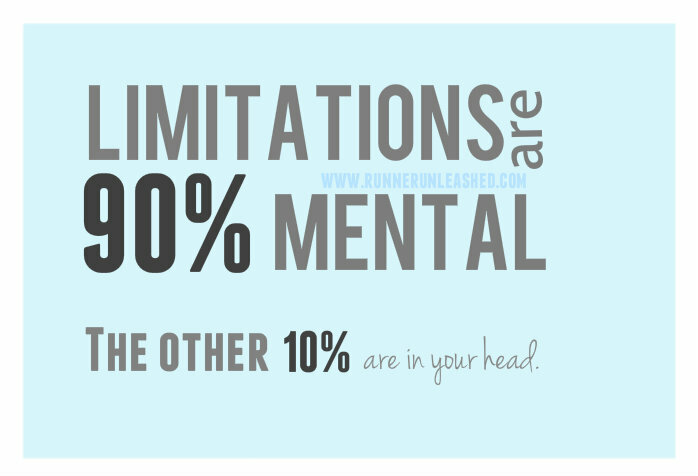 The mind is a powerful thing! Try breathing in for 3 to 4 strides, then breathe out for 3 to 4 strides. You’ll be so focused on that, you won’t even realize you are close to being done with your run. It is also a form of relaxation. It is all in tricking the mind. 5.- Repeat your favorite mantra. Many of us repeat mantras in our head when we are doing long runs, but they also work to keep us going on the treadmill. Pick your favorite 2, repeat them in your head and match them to your stride. Again,tricking the mind 😉 Some examples: I can I will, I’m strong enough, Don’t give up, What doesn’t kill you makes you stronger. 6.- Play some tunes. Running on the treadmill is all mental, at least in my opinion. So keeping your mind occupied is the best way to “survive” on the hamster wheel. Hook up some headphones to your favorite radio station, or find your favorite podcast. You can even listen to a book while you run. Many do it and it passes the time pretty quick. 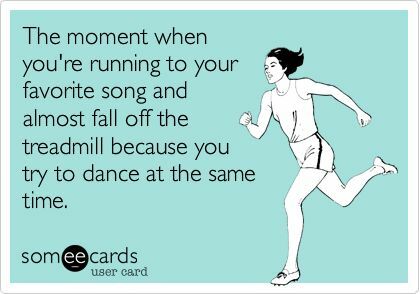 If you have a book you want to listen to, or some songs that get you going, only listen to them when you are on the treadmill. That way they won’t bore you and will have you looking forward to your next treadmill run. 7.- Cover up. When you are waiting for something to end, there is nothing like waiting for a whole minute to go by when you are on the treadmill. There have been times where I feel like I have done 3 minutes when in fact it was only 1. So I have covered up the clocks on my treadmill. I only left my pace, mile, calories, and incline visible. 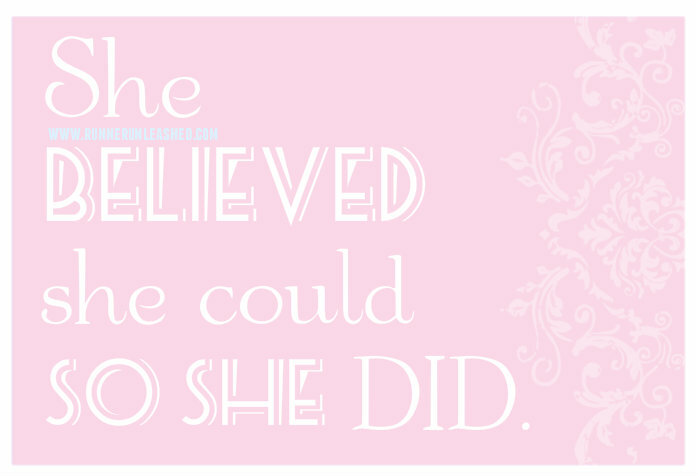 I have covered it up with CogniTea‘s infamous line: I CAN I WILL. 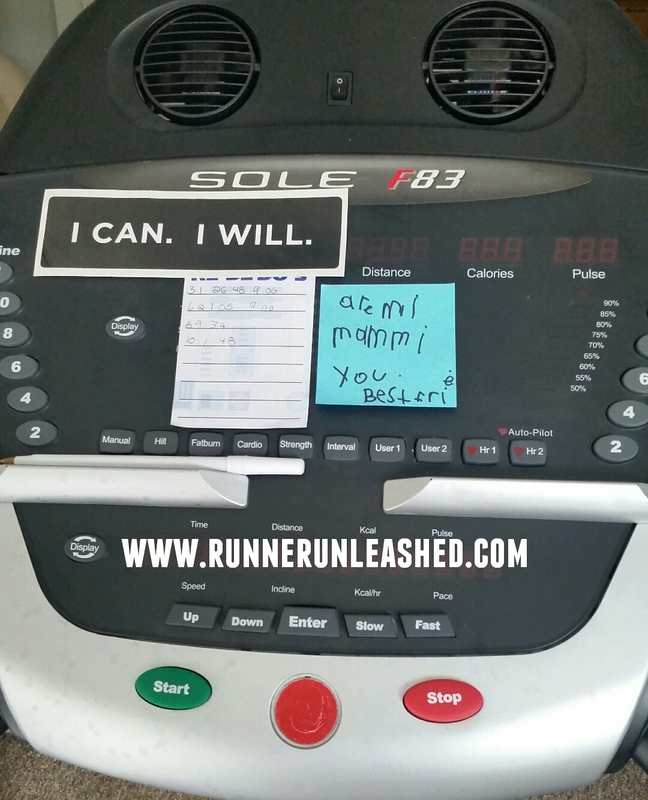 It has helped along with little notes that my son leaves for me to read on my next run. 8.- Workout AND run. Running is a great way to break a sweat, so why not make it interesting? Add some leg workouts to your treadmill runs? Once you are warmed up, find your 10K pace and for each mile you complete, do some walking lunges or squats. For example: You can slow down the treadmill enough to do some lunges on it, or just step off. Do 10-20 lunges or squats each mile, doing 5 reps.
9.- Time limit. Another way to beat the treadmill blues is to limit your time on it. Save your long runs for the outdoors. 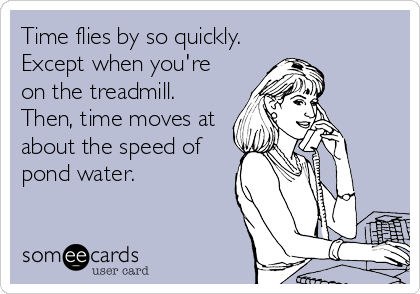 If you run on the treadmill at the gym, some of them have time limits anyway. You can spend 30 mins or however much you can take, and switch to another station. Do the stationary bike, or swim some laps. 10.- Step to the beat. Instead of just running with music blaring in your ears, use it. I do this outside as well to keep control of my breathing. Listen to the tempo of the songs. When you have a faster tempo playing, run fast! When you have a slower tempo run slower. It’s almost like running cadence, you are just using the music to guide your speed. I know a while back spotify has an option where you can set it to play music according to your speed. Try it out. It’s what I use and I love it! Try some of these tips to make running on the treadmill more fun. It doesn’t have to be boring and repetitive, there are different things you can do on it. It’s perfect for speed because you have no choice but to run at the speed its set to. 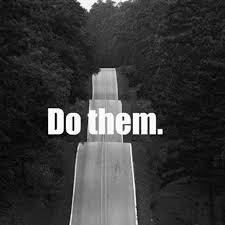 If you run hill repeats, you don’t have to worry about pounding on the way back down. I have trained for my last marathon, and currently training for the NYC marathon on a treadmill. The days I go outdoors for a longer run I have been holding a faster pace for longer. The speed work on the treadmill has been really beneficial, especially on days my son doesn’t want to run 4 miles in the heat. Previous Previous post: Be brave, be courageous, BE YOUtiful.